We can ship this ambulance to every African destiny. Check our stock for more offers. We sell all truck brands, new and used. JB Trading is one of the biggest suppliers of trucks and spare parts. We are specialized in every brand, second hand or new. We ship your orders worldwide with competitive prices. Deliveries to Africa can be done in a few days with DHL or by low cost sea transport (prox 4 weeks and 250 USD â€“ 1 CBM). Our stock of more then 700 trucks and our most popular parts can be found on our website www.jbtrading.com. Mail or call for other inquiries, latest prices or questions about specific parts and serial numbers. 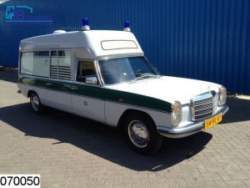 Visit the website for more Car sale Africa Ambulance. Click here.